Gov. 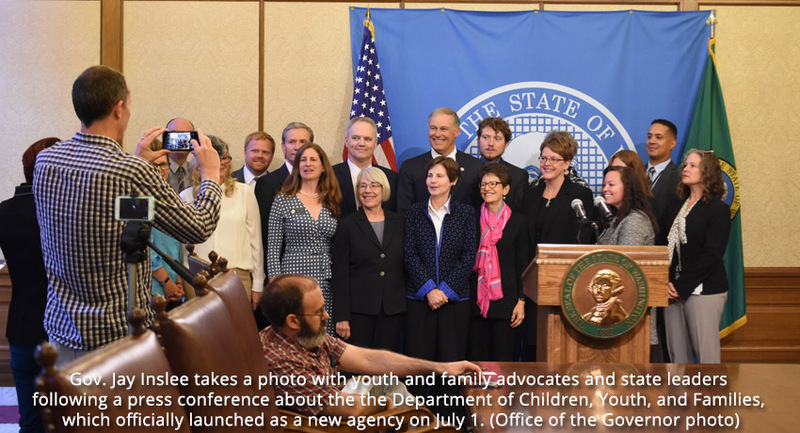 Jay Inslee was joined today by youth, family advocates and state leaders to celebrate the launch of the state’s new Department of Children, Youth, and Families. The agency’s opening on July 1 was the culmination of a two-year effort to transform the way Washington serves at-risk children and families. Not only does the new department bring together early learning and child welfare services previously housed at separate state agencies, it supports the philosophy in Washington state that all children get an equal opportunity to succeed and that families benefit when services and policies take a preventative approach to problems, Inslee said. DCYF staff includes foster care workers, social workers, licensors, researchers, and policy experts in the fields of early learning and child welfare. The cabinet-level agency combines the Department of Early Learning and the Children’s Administration, which was formerly part of the Department of Social and Health Services. In July 2019, DSHS’s Juvenile Rehabilitation Administration will also join the new department. Proponents of the transformation modeled it on successes seen in other states. New Jersey, Wisconsin and Tennessee, for example, have set up departments dedicated solely to serving children and families. These agencies have displayed more accountability and more easily instituted policy improvements while they spotlight the importance of these services to reach more families in need. The process for considering a unified agency devoted to children and family services started when the governor issued an executive order creating the Blue Ribbon Commission on Children and Families. The commission’s work resulted in a bipartisan and unanimous recommendation to establish DCYF. Inslee signed House Bill 1661 on July 6 of last year, starting the transition process that created the new agency. While testifying in support of HB 1661 last year, Annie Blackledge, executive director of The Mockingbird Society and someone who grew up in foster care, said that the old way of structuring child welfare services isn’t sustainable and allows some of our most vulnerable to fall through the cracks. Sabian Hart, also of The Mockingbird Society, said today that the new department is off to a strong start , especially because it has an Office of Youth Engagement. The two co-chairs of the blue ribbon commission, retired judge Anne Levinson and state Rep. Ruth Kagi, also spoke at the celebration. With DCYF, Washington also has an opportunity to create a cohesive support system for kids and families. DCYF will work to identify where families encounter gaps in services or have difficulty accessing services. By closing those gaps, DCYF can help reduce family trauma and promote family resilience and well-being. Through its Office of Innovation, Alignment, and Accountability, the new agency is working with experts around the state to develop goals and examine the ways in which race, ethnicity and poverty affect a child’s opportunity for success. Hunter, a former DEL director, has been serving as DCYF secretary since Aug. 1, leading a yearlong transition effort that has involved hundreds of staff across DEL and DSHS. Watch a video of the press conference on the governor’s Twitter page.